University professors and scholars in the Middle East face repression and risk as a consequence of war or government intervention. These are dark times for university professors and scholars working in much of the Middle East. The Turkish case is emblematic of the wide-ranging attacks on universities and academic freedom in the region. Over the last year, thousands of professors have been removed from their positions, all university deans and presidents were forced to resign and some 15 universities were permanently shut down in Turkey. Beyond Turkey, academics face repression and risk across the Middle East, whether as a consequence of war (Syria and Yemen) or government intervention (Egypt and Bahrain). No longer able to work as academics, many scholars from the affected countries face a form of civil death. We at the UCLA Center for Near Eastern Studies (CNES) are seeking funds to host and support such a scholar as a Visiting Scholar next academic year, working in conjunction with the national organizations Scholars at Risk and the Scholar Rescue Fund. The scholar will gain respite from the repression that she or he may face at home, as well as a chance to connect with international scholarly networks. UCLA will also benefit enormously from this effort. The expertise of the visiting scholar will enhance both the university’s curriculum and CNES programming; UCLA faculty will have the opportunity to collaborate with a deeply knowledgeable country expert; and students will access an unmediated understanding of the worldwide crisis in academia. Please consider making a donation to host a scholar-at-risk at UCLA. Concerns about academic freedom in Turkey have been mounting over the last year beginning with a campaign of government reprisals against academics that started in January 2016 with the publication of a petition signed by a large number of Turkish academics in the social sciences and humanities that called for the resumption of negotiations between the Turkish government and the Kurdish guerilla organization, the PKK. 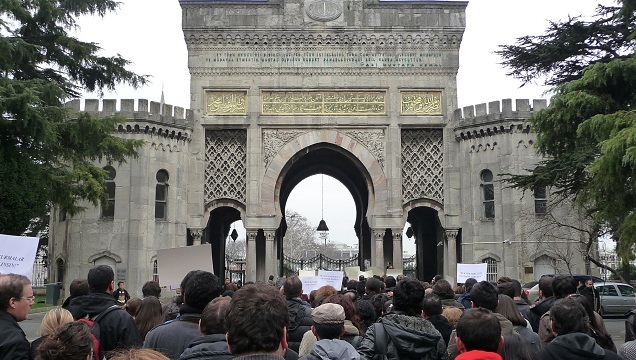 Because nearly two-thousand Turkish academics and scholars had signed the petition, when the government decided to target all signatories it effectively declared war on Turkish universities. In January 2016, the president of Turkey called the signatories of the “peace petition” as it was colloquially known, “traitors,” which ignited a witch-hunt that has taken many forms. For example, signatories had their names and photographs published by government-affiliated media in a bid to expose them to private vigilante attacks (of which there were many). Signatories’ office doors on their campuses were marked with red paint to single them out as “traitors” to be targeted at their universities. The government used its regulatory powers to initiate widespread institutional disciplinary investigations, suspensions, dismissals, and blacklisting of faculty members at public and private universities for their signatures. Further, the government used overbroad counter-terrorism laws to initiate mass criminal prosecutions of all signatories on the pretext that their call for peace talks amounted to material support or “terrorist propaganda.” These charges have resulted in house raids, detentions, and arrests of academic signatories. While 2016 began with an unprecedented assault against academics based on their support for Kurdish rights and a peace process, the scale and nature of the repression targeting academics and universities escalated dramatically over the summer in the aftermath of a failed coup attempt against the government in July. In the wake of the attempted coup, the government declared a state of emergency and began to rule by emergency decree—a situation that continues nearly six months later. Acting by decree, the government first demanded the resignation of all university deans and presidents across the country ushering in a period of mass investigation of university administrators and a procedure by which deans and presidents were to be restored to their positions on the basis of loyalty assessments. Next, the government permanently transferred the authority to appoint university presidents directly to the president of the republic, canceling the system of faculty elections and thereby ending any pretense of university autonomy or self-governance. The government also took measures to close seventeen private universities and dozens of college preparatory schools, seizing the assets of these institutions and transferring them to the control of the treasury. These university closures led to the dismissals of thousands of academics and research staff from their positions. Beyond those who were dismissed by virtue of university closures, thousands more have been purged from their positions at public universities across the country through three emergency decrees that identified lists of faculty by name as suspected threats to national security. In each case, faculty who have been purged face what is best described as civil death: they lose not only their positions—in many cases as tenured faculty with long and distinguished records in their fields—but also their livelihoods, their housing (because faculty at public universities typically live in subsidized faculty housing to compensate for low salaries), their pensions, in some cases even their access to their bank accounts or savings, and passport cancellations not only for those suspended but also for their spouses. Whole families have been rendered homeless, without access to any means to support themselves, and cut off from the possibility of travel to find fellowship support abroad on the basis of their academic credentials. Moreover, those purged in this manner with their names published on lists provided by the government as suspected traitors become functionally ineligible for any other form of work in the public or private sector. Yesterday’s tenured professor may not be able to find work as a janitor in today’s repressive Turkish context. The sheer scale of the targeting of individuals and institutions belies the government’s claims that those being targeted are somehow related to the coup or were coup-supporters. Instead, the targeting pattern suggests a much broader effort to rid the academy in Turkey of anyone perceived as either critical or inadequately loyal to the government. Moreover, government created “hotlines” encouraging anonymous tips concerning alleged coup-supporters have been used to purge individuals from the civil service generally as well as academia, making everyone vulnerable to being marked for the next wave of purges based on nothing more than private vendettas and other kinds of score-settling by citizens turning on one another. Nor has this attack on academics occurred in a vacuum. Rather, the attack on opposition voices, critical thinking and dissent has extended to every corner of the country. Whether one considers the tens of thousands of civil servants purged from every ministry or the remarkable onslaught against all forms of communication, traditional and virtual, the portrait that emerges from Turkey over the course of 2016 is a stark attack on freedom of speech, opinion, thought, assembly and association that undermines the essential requirements of scholarly endeavor and for that matter of political freedom. Freedom of expression has been especially gravely undermined, with hundreds of media outlets banned, more than 130 journalists in prison (with Turkey exceeding every other country—including those in the rest of the MENA region, and China and Russia—in its targeting and imprisonment of journalists), and hundreds of civil society organizations closed. In addition, ten parliamentarians and hundreds of party officials (at the local and municipal level) who are members of the third largest political party in the country have been detained. That party, the HDP, is a progressive umbrella party representing over five million voters including Kurds, Armenians, Alevis, Ezidis, leftists, feminists, and LGBTIQ individuals, all of whom have been stripped of their representation by virtue of the imprisonment of their elected officials. The egregiousness of the circumstances in Turkey is nearly unimaginable. This is all the more the case because of the precipitousness with which much of this repression was introduced. At the beginning of 2016 the risk of such measures would have seemed scarcely credible to most academics working in Turkey. Today, those trapped in the country are disoriented by the speed with which their freedoms and their ability to conduct their research and teaching have been undermined. Those who happened to be outside of the country at the time of the attempted coup have, in some instances, found themselves suddenly unable to return. Those who have been purged now face uncertainty and peril at every turn. Those who are detained have almost no prospect of receiving any due process or fair trial and are not even informed in most cases of the charges against them. Lastly, the small remaining category of academics who retain the ability to travel and are seeking to maintain their research and scholarship independent of government control are in dire need of external support including in the form of scholar-at-risk programs that can help them find a temporary position outside of the country at a host institution. We hope that UCLA will be able to serve as such a host institution for a Turkish scholar in the coming academic year.